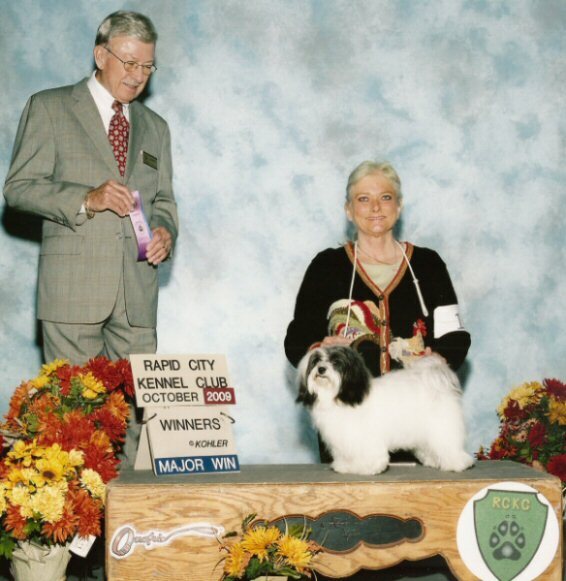 Another title earned by Me, GCH CH Hapi! I finally decided to be a show girl! Happy GRAND CHAMPION to me, Happy GRAND CHAMPION to me. Oh ya, I did it! 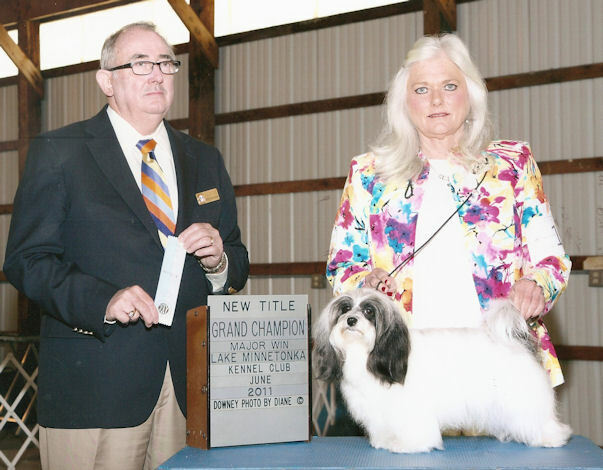 Prissy Missi doesn’t have anything over me now, I am a GRAND CHAMPION! Wow!! I got my second major today!! 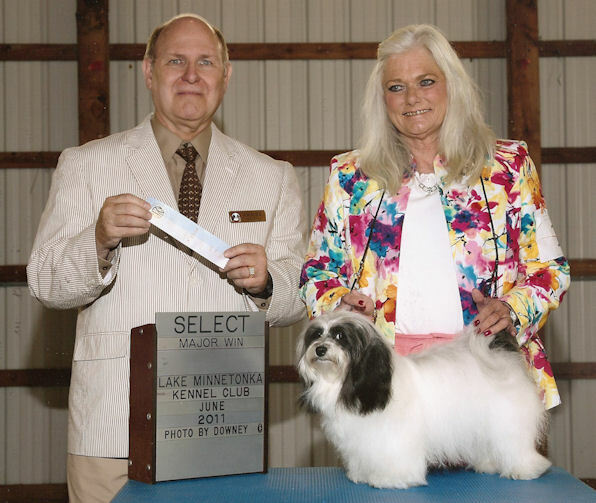 It was a large entry of very beautiful Havanese, large enough for me to get a 4 point major! Thank you Mr. Steve Hayden, I really enjoyed your ring today. Now I only need one more major for my new GRAND title. Tomorrow? Oh ya, I still have it and I can strut my stuff! 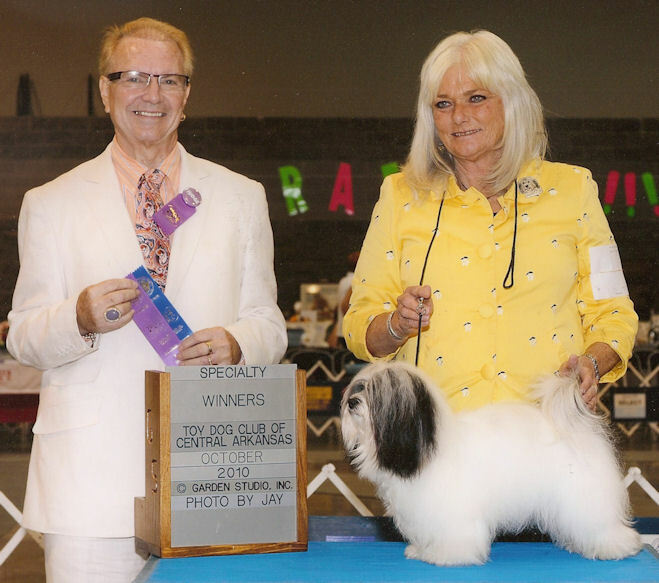 I have the gait, the Havanese gait and just love to show it off. I took out Little Bee today, yea!!! I got select but still no major win, ugh! Well my luck is back! I got select today but no major win. I NEED A MAJOR!! Two of them to be specific. I’m totally pointed out now for my Grand Champion points. Oh my, I need two majors now! The easy part is all done. I did really well on Friday; I got another point with a Select win. Saturday was a bust and Prissi Missi thought she was really big stuff taking me out. I had to walk out of the ring without a ribbon! Sunday I got even though. Prissi Missi was a little too big for her pants, I took her out for two more points and guess what, I gave Mom her Mother’s Day present this year. I gave her a winning Ribbon! YEA!! I guess I got a big head taking Messy Missi out both days last weekend. She got even with me, I got Select both days this weekend. Oh well, I picked up 3 more points and there is always next weekend! Wow my string of wins hasn’t stopped! I just love to show especially when I win and even better when I beat Missi! Oh ya, I took Missi out both days. I took Select for another point on Saturday but Sunday there wasn’t enough girls for me to get any points. I still beat Missi though! I think I might let her win next week just to make her feel better. She’s kinda moping around. I just keep rolling! 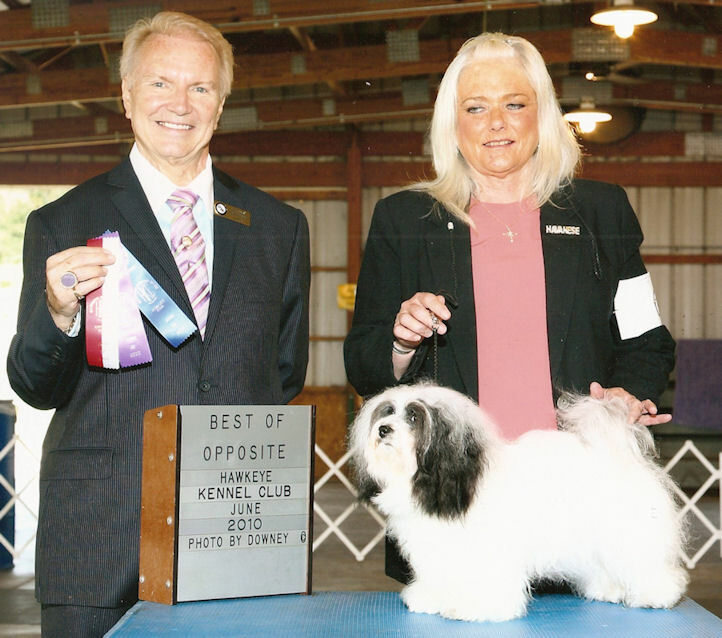 Wow, I took Missi out on Saturday for Best of Opposite and a 3 point major! Thank you Mr Edd E Bivin! I told Missi that I was going to beat her and I did on Saturday at least. I guess I got too big for my britches; Missi came back on Sunday and took me out. Oh well, I got 2 more points on Sunday and I can call it a good weekend. I’m on a roll! I took Select both days and picked up two more points. Wow! Saturday was a bad day though. Mom spent too much time grooming other Havanese and I didn’t like that. I told Mom about it too. I let her know that I don’t like her touching other Havanese! I get jealous. I went into the ring and that Prissi Missi took me out! Sunday was a little better, Mom gave me all her attention and I loved it! Prissi Missi took me out again, ugh. I told Missi to get ready for next weekend, I’m going to take her out. Wow! I competed with some very nice boys and girls today. It was so much fun to be back in the ring after a long cold winter. 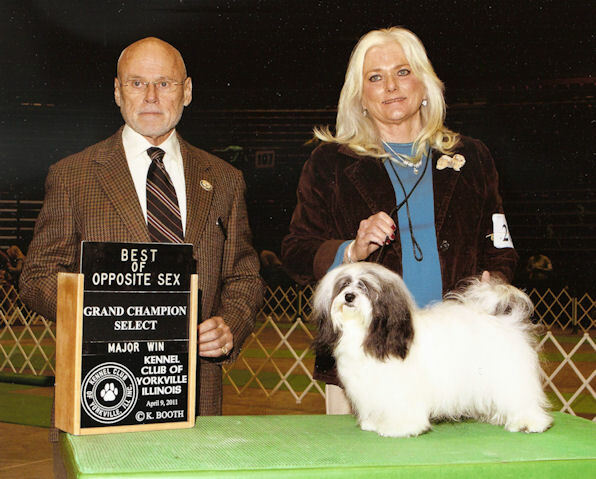 I told Missi to move over that I have a new title to work on now, my Grand Champion! I told her that I was going to beat her today and I did! Prissi Missi was not very happy about it either. He He! I had to step it up though now that I’m in the big ring with the big dogs. I walked perfect for Mom and held my head high. It paid off too. I got Select girl for another 2 points and another Champion defeated. Wow! It was my first weekend out as a special and it was very special for me. Saturday I didn’t perform well. I wanted to play with Bee and I pulled too much. Mom told me I blew it and I had to pay attention to her. This was very serious stuff now. And yes Bee took me out on Saturday and I got Select for 2 points. On Sunday, I took it seriously. I wasn’t going to let Bee beat me! I performed very well and it paid off. I got Best of Opposite for 2 more points and 1 Champion defeated toward my Grand title. Yea!! Mom told me that there was a major in Springfield and I told Mom that it was all mine! I said that I was going down there and getting my last major. I was tired of dragging this champion title thing out. Let’s get this over! I was also tired of that prissy Missi giving me grief over not having a title. So guess what, I went in the ring and won my class, and then I won Winners. I so happy! I thought that I got that major but Mom informed me that someone pulled their girl and it was not a major. BARF! She told me that I had to beat the boy to get the major so the pressure was on. He was a really handsome boy and kept looking at me so I had to really strut my stuff. I had to win the judge and impress the handsome boy so I really worked hard at looking good. I took Best of Winners for a 4 point major! YEA!!! I have my title now. The good luck kisses worked! 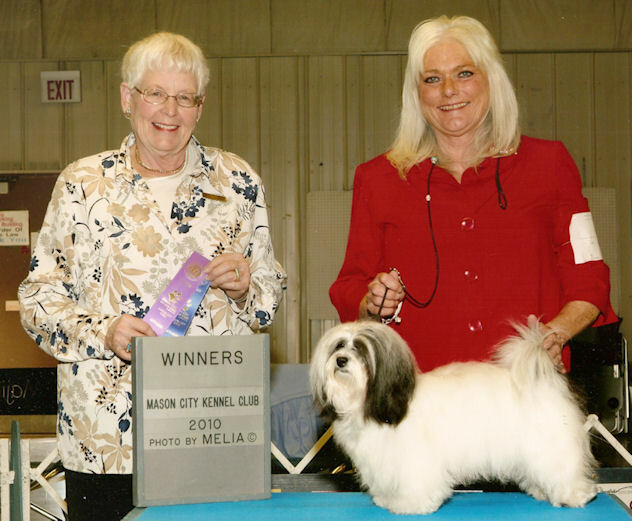 I gave Mom kisses and more kisses before we went into the ring both days and I won both days. I’m really on a role! 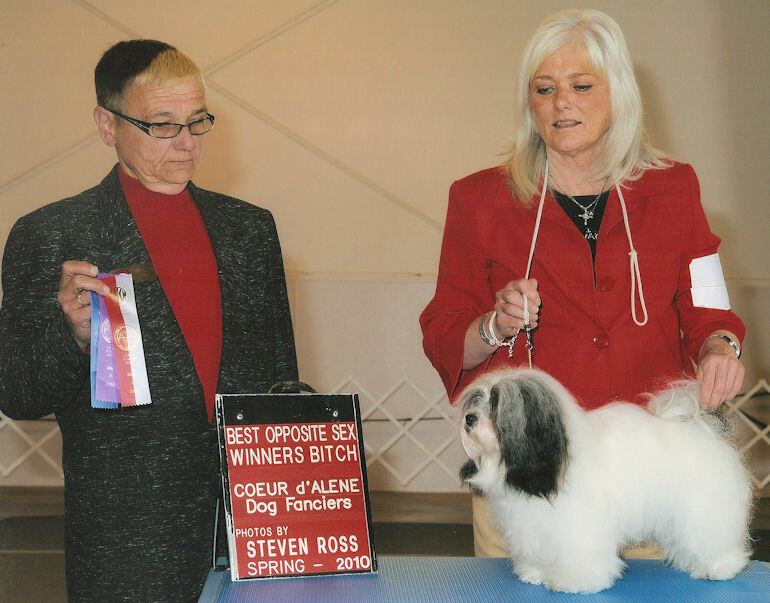 It was a very nice line up of Havanese this weekend and any one of us deserved to win so I went in the ring and strutted my stuff like I never have before. I got Winners Girl both days! Yea! It was a major both days for the boys but the judge didn’t give me Best of Winners so I couldn’t get the major that I so desperately need. Growl! Oh well, there is always next weekend and it is a major for the girls and I’m going in the ring and getting it. So check back next week! I won again! WOW, I’m on a role! I figured out the trick, I have to give Mom kisses and more kisses before we go into the ring. It just calms me and Mom. We both like kisses. I strutted my stuff and really worked hard in the ring. It paid off too, I got another point! I’ve almost got my Champion title. Next week I’ll have to give Mom kisses and more kisses for good luck! Wow, Mr. Usherwood came through for me again! He is consistent! I got Winners girl for another point! I got to go to beautiful Hot Springs Arkansas and I got to show too. It was a really fun trip. I got to see Mom’s home area and it was so much fun. I got to see my friends from Texas also. 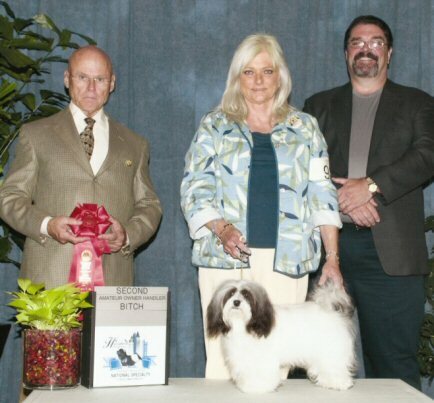 I really like Ditto, he is so handsome and so is his brother Cody who took Best of Breed today. Missi got Best of Opposite because she was too busy looking at Cody. Mom told her to knock it off and pay attention to the judge when she is in the ring. I got a bath too but it wasn’t the Hot Springs spa treatment! Mom told me that the water was too hot for puppies. I didn’t believe her. Yesterday was a terrible day in the office! Politics! Well that’s all I’m going to say about that. Today, I came back and took care of Family Business! Oh ya, I took out some really nice girls and a professional handler to boot! 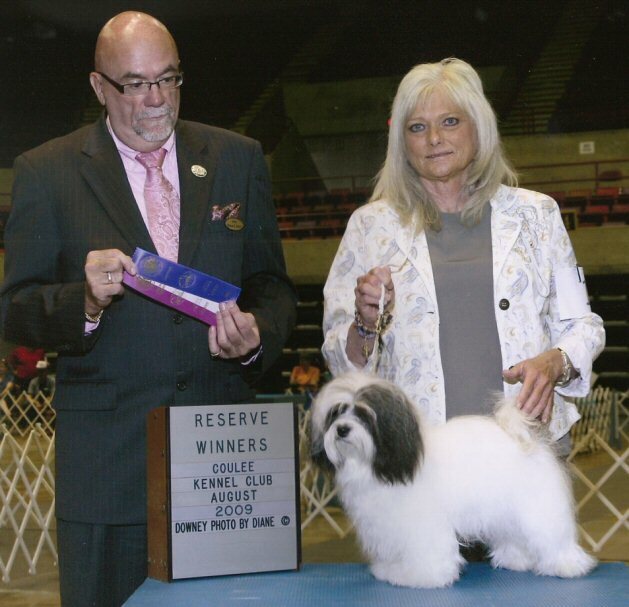 I cleared the path for Missi to take breed which she did and deserved the win, she was beautiful. I took Best of Winners for another point. Yea!! Dynamite comes in small packages. It was just another day in the office, he he! I’m so happy today!! I took out that prissy Missi for Best of Opposite. Oh yea, the judge just loved me! I got another point! I also got a lot of cheese, I just love cheese. This judge loved my gait and my rise. 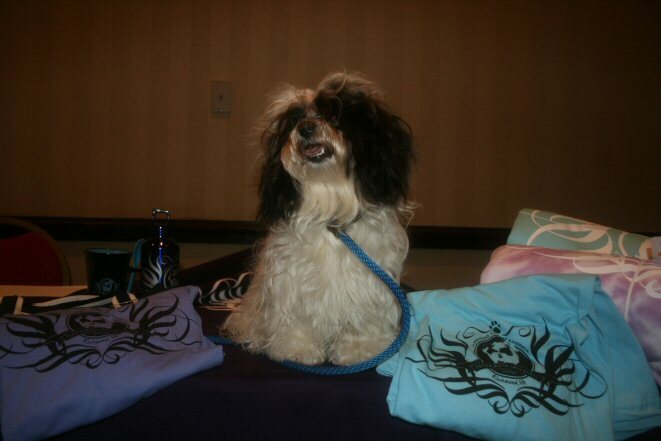 Said that I was all what Havanese is about! When you got it; you need to strut it, right ladies? I even took out Ch. Missi for Best of Opposite. Wow, Mom was so proud of me. She gave me a big hug and kiss. I even got to take two pictures, one for each point. This has been such a fun trip. I have seen so many new states and taking in the sights. 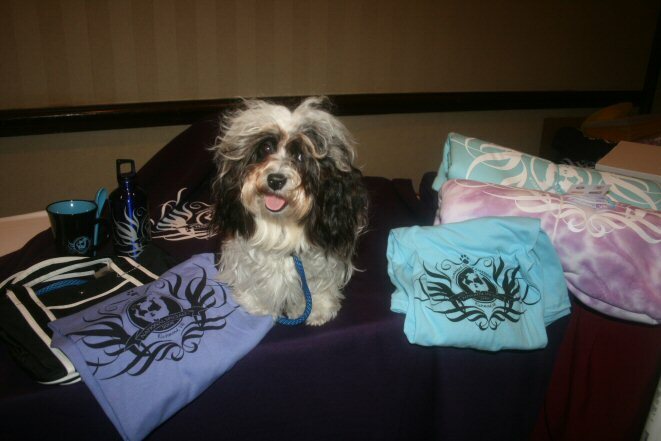 Lots of fun stuff for such a special little Havanese. Oh my, the lovely judge just loved me! She gave me Winners Girl today. 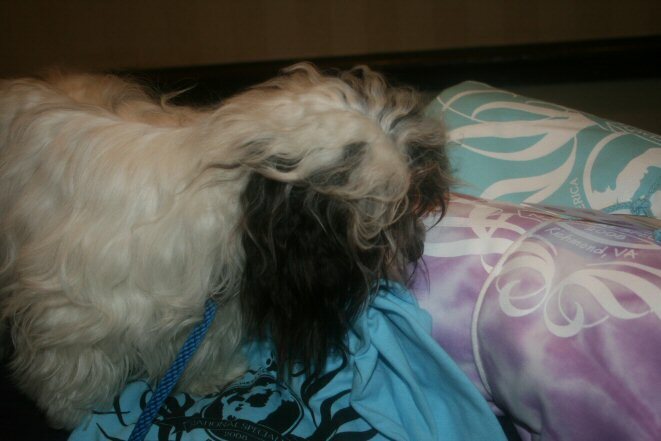 Mom made a big mistake though; she gave me to a very good friend to show me for breed so that Mom could show yoR. I wanted my Mom to show me! I pouted the whole time. I didn’t walk, stack, or do nothing but try to get to Mom and yoR. When I was taking my picture with the lovely judge, she told Mom that I was the best thing she has seen in a long time. 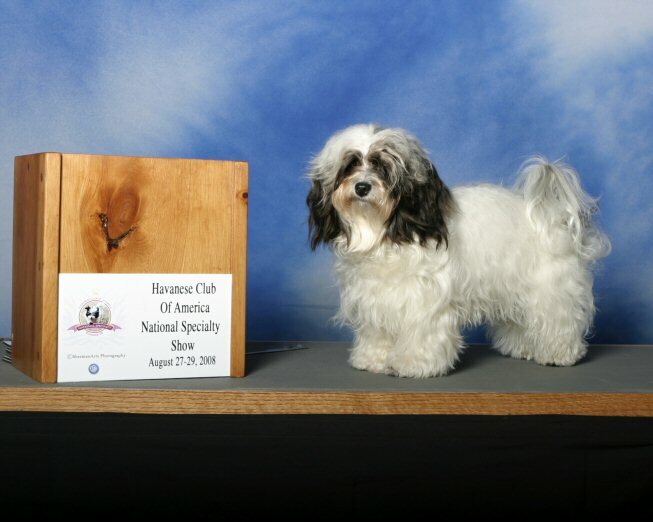 It was very refreshing to see a girl that reminded her of the original Havanese (that comes from biological Dad, Fire). She also told Mom that she should have shown me for breed because she was considering me for Breed! I was so upset with Mom I didn’t forgive her until that night when we went to bed. I gave her kiss and told her that I loved her. I also told her, DON’T MAKE THAT MISTAKE AGAIN!!! My Mom finally figured out that I like cheese. I will perform for cheese! Any kind will do but I really like string cheese. I strut my stuff for that cheese. I walked so good that I got Winners girls today for my first major, a 3 pointer!!! 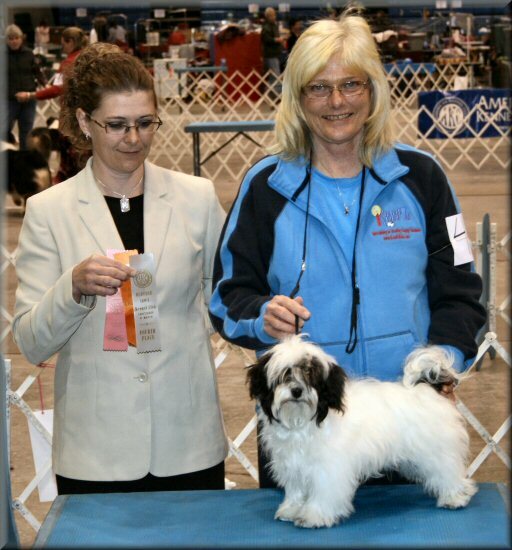 The judge told Mom that I have ‘The’ Havanese gait!!!! When you got it, you got it!! Mom didn’t tell him that it was the cheese so we will keep that one a secret, he he. Oh my, the competition was tuff! 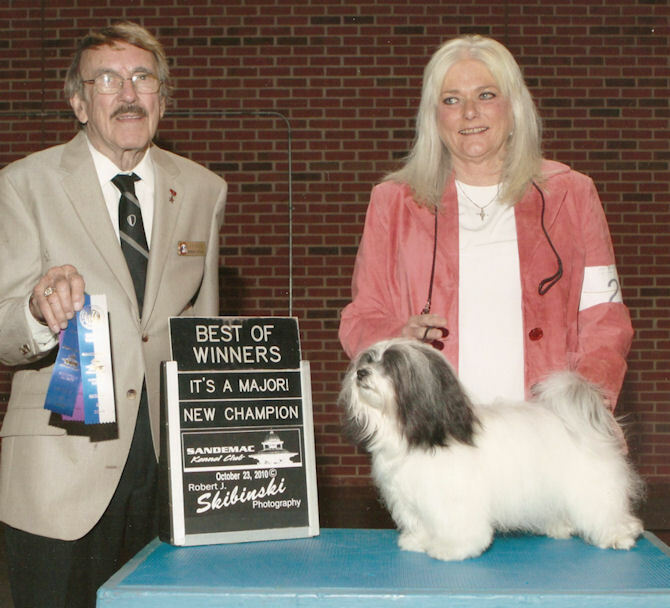 Just about every Havanese show dog in the country was there! Wow, so many and all were marked and colored differently. The rainbow was shining in Chicagoland this weekend. 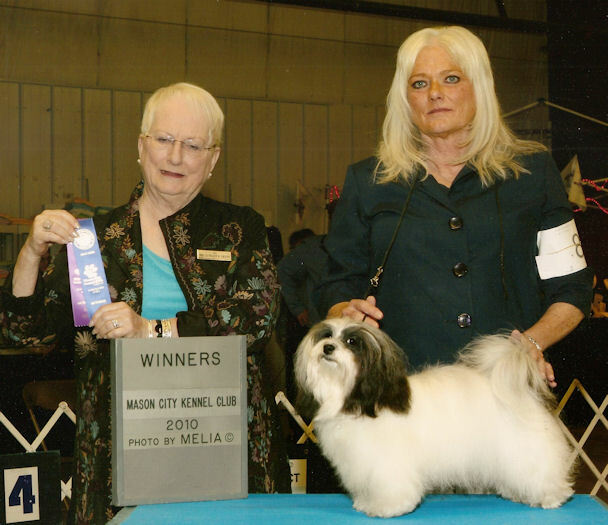 When it came time for the breed competition the ring was absolutely full of Havanese and handlers. Mr, Bivin split them all up into groups of 5 so that he could see all of them. It was so much fun. I made so many new friends and got to see old friends. I got to see my breeder Mom. She was so excited to see me show. I was really nervous in the ring, it was the first time I have been judged by Mr, Bivin and I was afraid of what he might think of me. 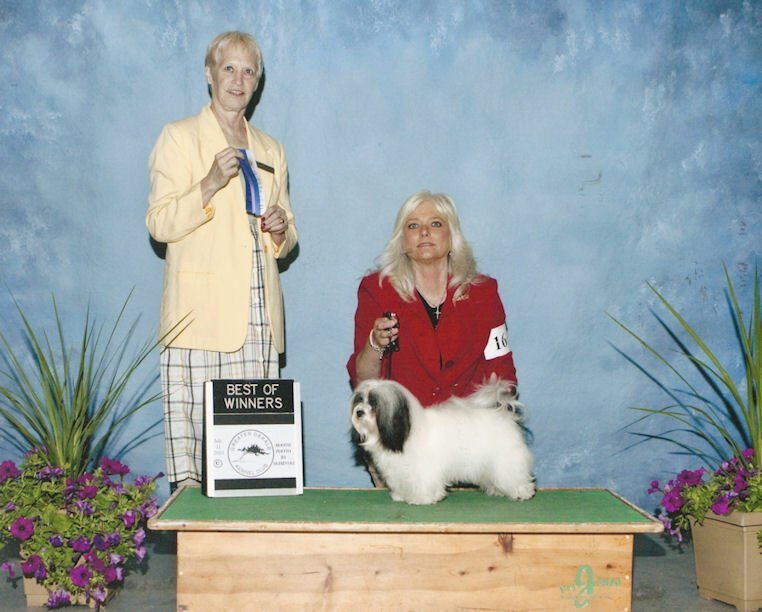 He must have liked me, I got second in my class, wow, that is really good for a National Specialty! Oh my, I think Missi jinxed me. She told me that she was giving me Bee’s Reserve crown that she wasn’t going to take it and that she was going to finish her Champion Title fast so that she didn’t have to take it. Well, guess what, I got Reserve today to a 4 point major. Mom and I have been working on my stacking and my table manners. It really paid off for us. I was so happy. I got a nice ribbon. Mom was so happy for me, I just love seeing her smile and take my ribbon but I refuse to take Bee’s Reserve crown! Bee will just have to find someone else to take it because I feel a really big win coming my way! I got Reserve Winners Girl Today!! Bee gets upset when she gets reserve since she has so many of them but I was so excited! I took out Bee and a bunch of other really nice girls. It was a 3 point major reserve! Mom was so proud of me, she told me that I performed the best. My Jr. Handler friend, Melissa, told me that I looked as if I owned the ring. I was so happy that I talked Mom into a picture. I’m really getting the hang of this show stuff. I really like it and I just love my Mom showing me. I do really good when I’m in the ring without Missi around. She likes to trick me into playing so that I loose to her. Well she did it again today. She beat me! I got reserve to Prissy Missi! I showed really wonderful today; well I guess it was ok. I was so excited to be back in the ring. Winter is really slow for shows and I don’t get to show much during the winter. I WANT SPRING!! I was so excited that I forgot to walk next to Dad on my down and back. I was pulling away from him. I think that is what blew it for me. I did get second in my class over a couple of really nice gals so I didn’t blow it completely. I’m getting better with every show! I performed perfectly today with my Dad by my side, he’s so handsome. Guess what? I got Reserve! Yea!!! I just love showing with my Dad. I’m really starting to like this show dog thing. I gave Mom a big Kiss after we were finished grooming me. She spends so much time helping me look my best and it’s a lot of hard work. So I gave her a big kiss and said thank-you. Dad walked in just as Mom was finishing up with my grooming. He was standing in front of the glass doors and sun was shining behind him. He appeared to be glowing. Quite a handsome site my Dad! 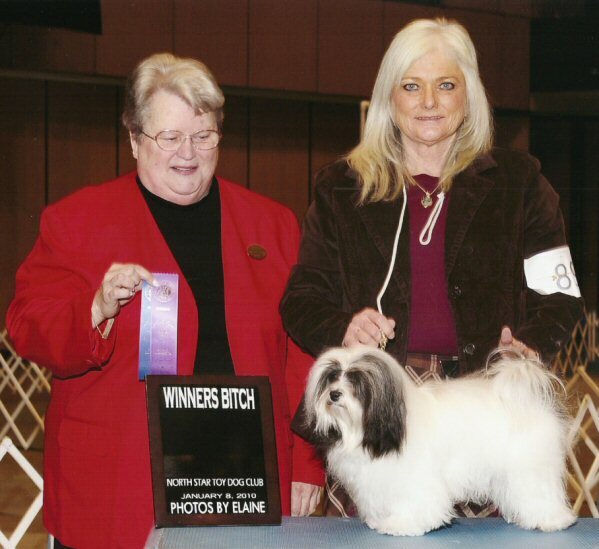 We got ring side about 15 minutes before our show time and the Judge was already finishing up on the dogs. Wow, were we confused. He had started early. Dad and I had to rush to get in the ring. It was confusing but you know what, I’m a show girl, Dad and I pulled it off. We got 1st in our class. I got another ribbon, yea! The best part about this weekend was I got to see my Aunt Sue Sue again. I just lover her, she’s so pretty! I got a ribbon today! I got first in my class. Dad told me that I did really good and showed like a champ. I think I like this show dog thing now. It was a really bad weekend for me. My class was really huge both days. Neither day did the judge like me. I didn’t even get a ribbon! I pouted all the way home. Today was a really bad day. Mom had a professional handler arranged for me but she stood us up! Mom had to show me and yoR. It was crazy! I tried to pull it off but on my down and back, I wasn’t concentrating and didn’t walk straight, I blew it. Too much confusion with being stood up and all. And the funny thing is; it’s really amazing how other people seem to think that your business is their business. Since we didn’t get the handler like planned Mom and Dad decided that one of us would have to sit out tomorrow and not show. I drew the short stick on this one, I get to stay in the RV with Missi tomorrow, BUMMER! I was great today. I performed really good and got first in my class. I got to go to Winners and compete against Bee. It was fun except I had some girl in front of me that could not stay still. She even hit me in the face with her tail. Mom told me to stay so I did. I just stayed stacked and looked at her. Mom put her hand in front of me to protect me from getting hit again! I love my Mom! I didn’t even win my class today. I just don’t think the judge like me. It was a bad day. Oh well, tomorrow. I didn’t perform as well as I did yesterday. I got a little bit too confident I guess. Mom told me that I have to stay focused and stay on my toes. Nothing is a given in the show ring, well not for Mom and me anyway. I got second in my class. Bee got Reserve and I sure had to hear about it but I’m so happy for my sister, she performed beautifully. Bee doesn’t have anything on me now. I performed the best I ever have and loved it. I finally decided that I want to be a show girl! I got Reserve! Mom told me that I looked beautiful in the ring and she is so proud of me. Mom was very pleased with me today. She told me that I have come a long way in such a short time. She told me that I perform my best today and I will only get better. I still didn’t feel the best and I think it showed a bit. I got second in my class again. My Mom was my handler today and we performed wonderful together. I wasn’t feeling the best, a bit under the weather, so I just didn’t have all my heart in it. Mom understood and told be to do the best I could. I got second in my class. 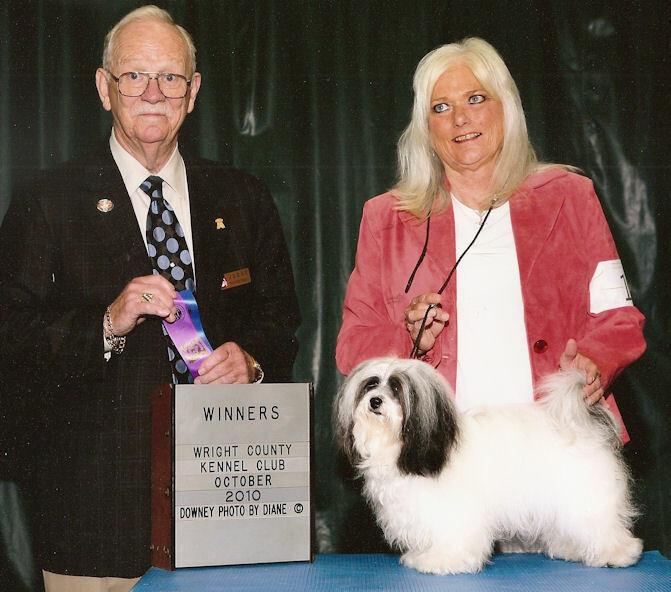 I didn’t get to show in the National Specialty this year because I was the Havanese Ambassador being the logo gal. The winners think they are the top dog? Oh no, I was the top dog this year! My picture was everywhere! On all the banners and posters, the catalog, people was wearing my picture on their t-shirts, the blankets they were covering up with (it was cold), the water bottles they were drinking from, their coffee mugs, and they even had me on their bags they were carrying. WOW! I was everywhere. The people just loved me and thought I was so cute. I got to meet a lot of really nice Havs and their parents. It was so much fun. I did sneak into the winners box and got my picture taken so everybody could see that I was the real winner! Wow, what a trip!!! I do have to give a huge Congratulations to all the boys and girls that got the trophies and rosettes in the 2008 HCA National Specialty! I'm the star of the show!!! This merchandise is so cool!! Me in the Winners Box! I must be getting the hang of things now. Dad told me that I performed the best that I ever have but, I do still need some work on my walking. I had so much fun and actually enjoyed showing today. I had to stay in the RV yesterday and didn’t get to show. I was upset so I told Bee to stay in the RV today that it was my turn. She didn’t like it, she pouted. I got 1st in my class. I’m still not sure how I’m supposed to walk in the ring. I like to pull away from my handler and get off the mat. I’m still learning; you I’m still just a puppy. Mom and Dad have been trying to tell me but I’m having problems learning how to walk correctly. I would rather play and be happy. Mom told me to be patient and I will learn. She will help me because she loves me so much. I got dumped today in last place in my class. I so excited that my Dad was showing me today and NOT MOM! I was too hyper and had trouble calming down and walking right. I did really good on the table for that ole table exam but on down and back, I didn’t do to good. I got 1st in my class. Well I had a good one with Mom today. We were ring side and she was grooming me getting me ready to go into the ring. I had already did some pre-game warm up but I always get a few minutes just prior to going into the ring. I was on the table with my top not still and they called my number! Dad yelled at Mom, get in the ring! She had to take my top not out and go straight in. She didn’t even comb my bangs! I was not ready and couldn’t walk for nothing. I was really upset with my Mom. I got 1st in my class but that’s it. Mom later told me and Dad that she thought there were 8 boys today and she didn’t realize it was time for my class. Hey Mom, the 8 boys is next week, Dah!!! I got to show with my Dad today. I did the best that I ever have done. Dad really handles me quite well. The Judge was a really nice man but I don’t think he likes little girls. I got 4th in my class. I did better today but not good enough I guess. I got 3rd in my class. Mom told me that I improved but I just have to let my personality go and show the judge what a Hapi little girl I am. It’s really hard to do that when you are so nervous. 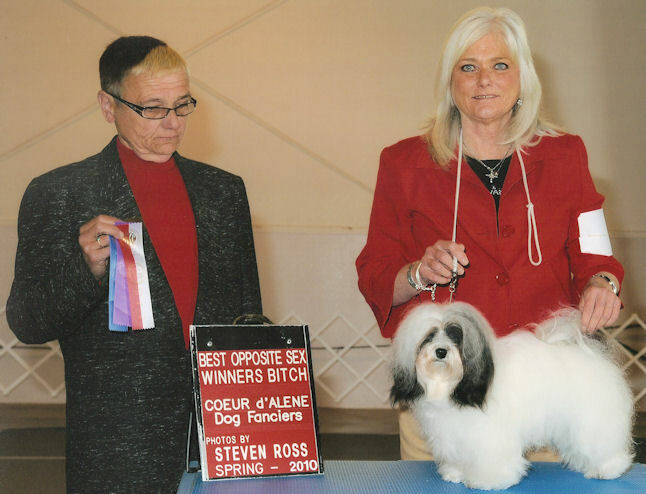 It’s a lot of pressure being a show dog. I finally got to show again after going on Family Medical Leave for the Puppy Kidz. I got filmed while Mom was grooming me by the local news. I was on TV. Wow, Mom called me a movie star! When I showed I had forgot how to walk. I wanted to pull away from Mom. I did stack perfectly for Mom though. I have to work on my walking. Mom says that when I do get going and walk right I have a beautiful gait. So I have work really hard on that so I can get my points I need to be a Champion. I got second in my class. Happy Mother’s Day Mom! I wanted Mom to show me today and she did. I did better on the table but I still have issues when a stranger walks up to me starts poking around. The Judge did tell me on the table that I have a really nice body and cute face. I think she liked me. Mom and I did much better walking but I still need some work. I’m going on Family Medical Leave while Bee has her Puppy Kidz so I can get some workouts in while I’m on leave. I got 1st in my class. I didn’t do too good today, I was really nervous on the table today. Dad had a hard time getting me to stack properly. When I did my walk around the ring I was still so nervous that I cut the corner and through Dad off. He almost stepped on me again! I think I want my Mom to show me tomorrow, her feet are smaller! I got 1st in my class. I just loved the judge I had today. She really likes puppies and was so kind to me. I was scared on the table, still afraid of Dad showing my tonsils but we got through it ok. When I did my down and back, the judge talked so sweet to me. She made me really relaxed. When Dad and I did our around, I was walking so good I forgot to turn the corner, you know I’m just a little puppy. Dad almost squashed me! I told Dad to be careful, he has to watch what I’m doing because I’m small and still learning. He told me that I get better every time I go into the ring but I need some work. I got 2nd in my class. Dad said something about a lot of homework this week. I don’t know what homework is but it didn’t sound like to much fun! I had a really nice judge today. I walked perfectly, will almost perfect. The judge was the one that Dad showed her Bee’s tonsils. Bee told me all about that episode. When the judge told Dad to show me the bite, I clamped down! I wasn’t going to allow Dad to show her my tonsils! I got first in my class. I was really relaxed and ready for the ring today. I got a little confused and forgot how to walk but I managed to straighten it out and walk really nice. I don’t like that table exam though. I didn’t want to allow the judge to examine me. Dad had a talk with me after the show and told me that I have to allow the judge to examine me on the table. That I have to be big girl and stand there like Bee and yoR do. I don’t want to let my Dad down so I’ll try harder tomorrow. I got first in my class. I had my first experience with a real show today. I did ok with Dad showing me but I was really nervous being in a real show. Wow, there is a lot of competition out there! 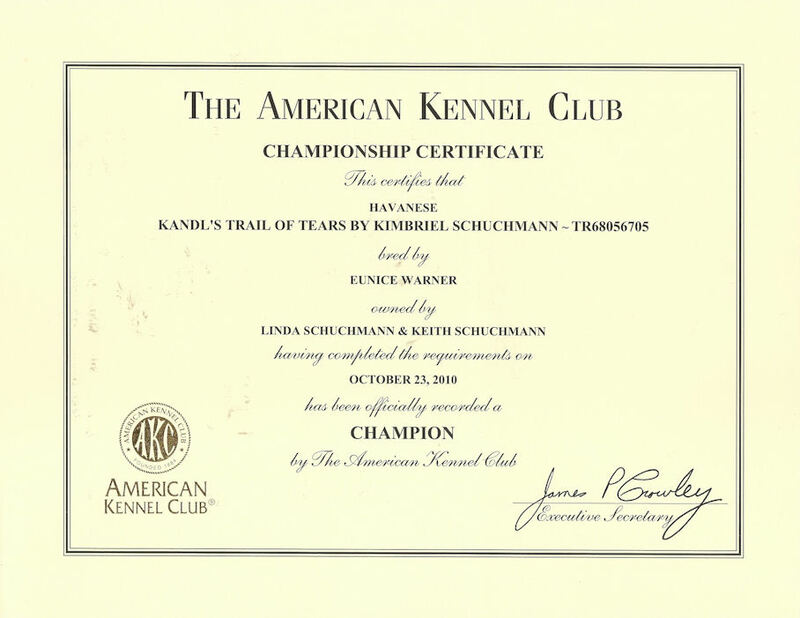 I got 1st in my puppy class and got to go in for Winners. There was professional handlers and everything. Mom said that Dad and I looked really good. I can’t wait for my next show, I like this show thing! I had my first experience in the ring today. I was scared, I didn’t know what to expect. Dad showed me in the Breed competition, which I won! While we were waiting for the Toy Group competition Mom walked me around on my new lead. I got a little more at ease. I didn’t know what to expect in the ring. That table exam is no fun! yoR told me about that table exam but I didn’t really know what he was talking about, now I know! I didn’t know that I was supposed to walk beside my Dad; I walked and pulled away from him. Mom showed me in the Group competition, I didn’t want to walk because I wasn’t sure what I was supposed to do. I froze and thought, gee I’ll just stack I know that one! Mom didn’t like it and made me walk. When I got to stack I did that really well. I got 4th place in the Toy Group. Not bad for a beginner!